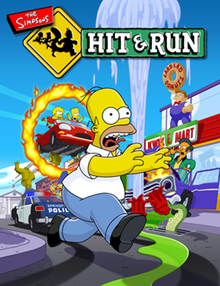 The Simpsons: Hit & Run is an action-adventure video game developed by Radical Entertainment and published by Vivendi Universal Games, for GameCube, PlayStation 2, Xbox and Microsoft Windows. It is based on the American animated sitcom The Simpsons, and is the twenty-second installment in the Simpsons series. It was released on September 16, 2003. The Simpsons: Hit & Run has seven levels, each with missions and a sub-plot. The player can control one specific character in each level. The game's playable characters are Homer, Bart, Lisa, Marge, and Apu, with Homer and Bart being playable twice each. When travelling on foot, the player character can walk, jump, run, and perform three types of melee attacks: a normal kick, a jumping kick, and a smashing move. To drive, the player can either hitchhike and control the driver in one of the many civilian vehicles that drive endlessly around town, or use a phone booth to select a car. Several hidden vehicles are present in each level and can also be used by the player if found. 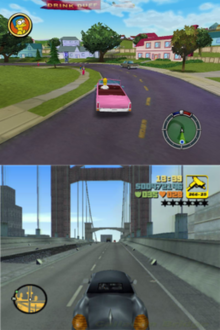 The game's driving missions are also similar to those of Grand Theft Auto III. In both games, the player races against other characters, collects items before a timer runs out, and wrecks other cars.